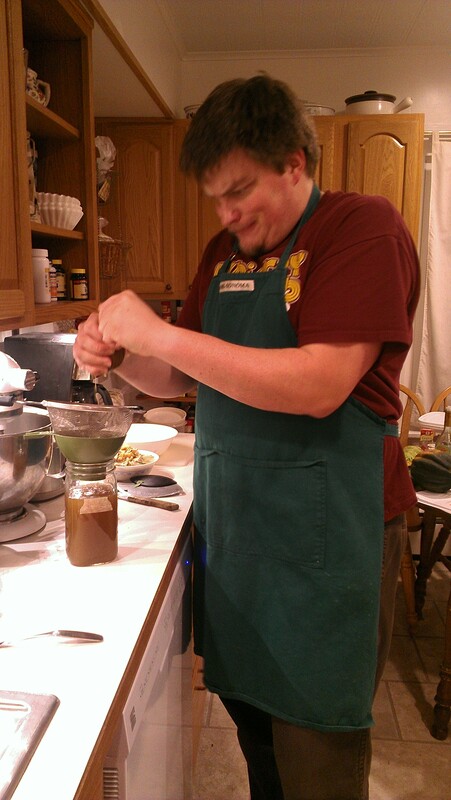 … it was happily macerating in jars, letting the 100 proof vodka (50% alcohol) extract all sorts of goodies from the chopped-up dandelions. If this sounds unfamiliar, you might want to go back and re-read the post about how I collected dandelions and started the tincture or the one about how to identify dandelions in the wild. So now, after 4-6 weeks, it’s ready to be finished up. 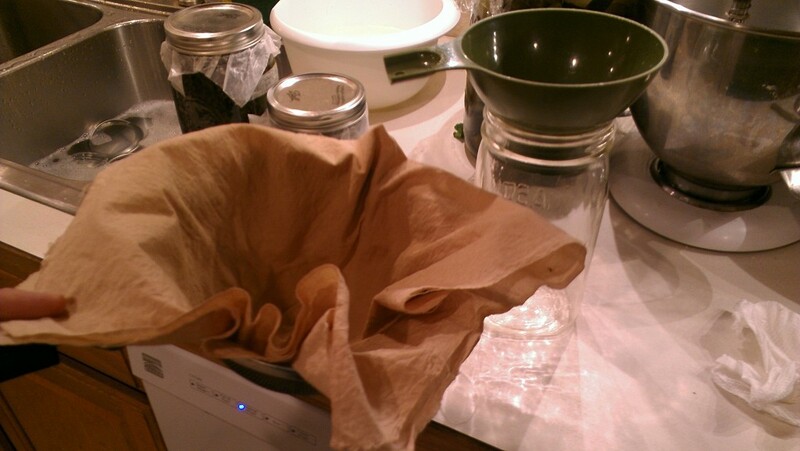 Line your strainer with a layer of muslin or cheesecloth. I like to use muslin because I think it filters better, plus it’s cheaper and lasts much longer. Mine started white and is now, after dozens of uses, kind of beige. I like to use a double layer of it, fully lining the strainer. 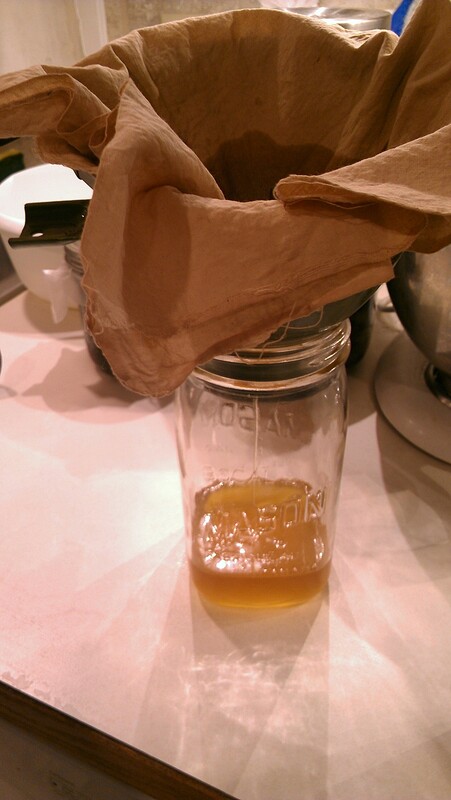 Next, I put the strainer inside one of those plastic canning funnels sold for working with Mason or Ball jars. This keeps spills and drips to a minimum. Put that whole assembly over a clean, empty Mason jar. I suspect this step is unnecessary when working with 50% alcohol tinctures, and I was a little haphazard in my sanitizing this time. But, it can’t hurt, and it might help. 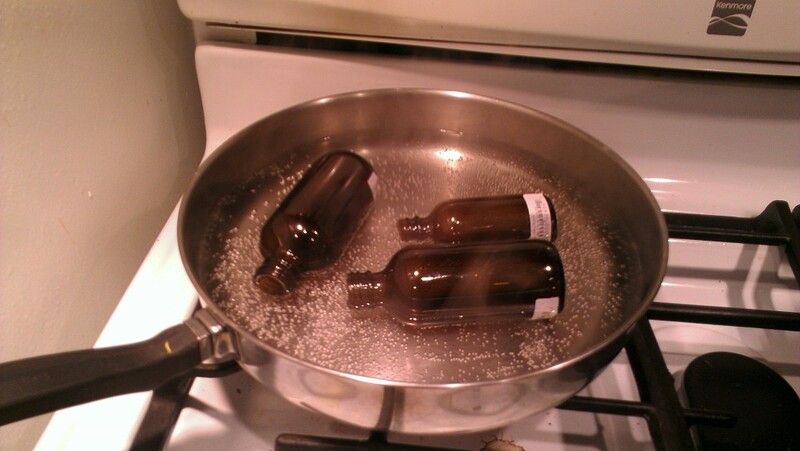 Get a pan of water boiling on your stove, with water deep enough to cover your bottles, etc. All of our pots were in use the night I did this, so I used a frying pan. Didn’t have quite enough water in it, which is why I say “a little haphazard”. But never mind. Place things in the water, being sure to keep the water at a rolling boil, and leave them in there for a minute or two. Turn them, if necessary, to ensure that the boiling water touches all surfaces. 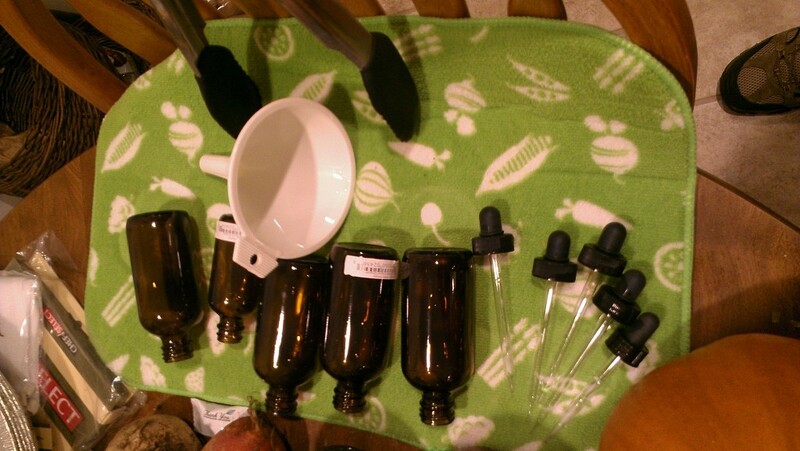 Then use your tongs to remove the bottles, jars, funnels, etc., and place them on a clean surface to dry and cool. It’s important not to touch the surfaces that contact food with your hands from this point onward. Mine was slightly cloudy, a yellowish beige color, with a faintly spicy aroma mixed into the evident alcohol fumes. It’s okay to taste the liquid if you like; it should be a little spicy and seriously bitter. Now our goal it to get all the liquid (menstruum, in herbalist terms) into the jars and get all the solid bits of dandelion (marc) to stay in the muslin. Start by pouring (or spooning, to start) the tincture, dandelion bits and all, into the strainer. It’ll go pretty quickly at first, but eventually the muslin filter will start to clog up and the stream of liquid will slow down. That’s when you pour a bunch of the tincture mixture into the strainer, then gather up the corners of the muslin in one hand and squeeeeeeeeeeeeeze the alcohol out of the marc. Notice that the liquid in the jar, which used to be clear, is now kind of cloudy or milky again. That’s fine. Yes, I really do look like that when I’m squeezing the marc. Note that the 100-proof vodka in the tincture will also be a fantastic indicator to tell you whether you have any cuts on your hands or fingers. If you already know that you have cuts, you might want to wear gloves to spare your nerves. 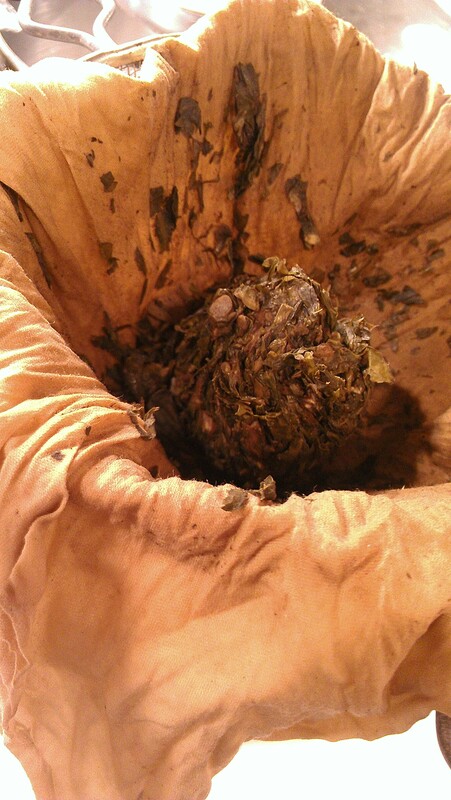 Once you’ve squeezed out all the liquid, you’re left with a ball of dried out plant matter. Give thanks for the health it’s going to share with you, and then compost it. If you can’t compost it, put it in the trash. 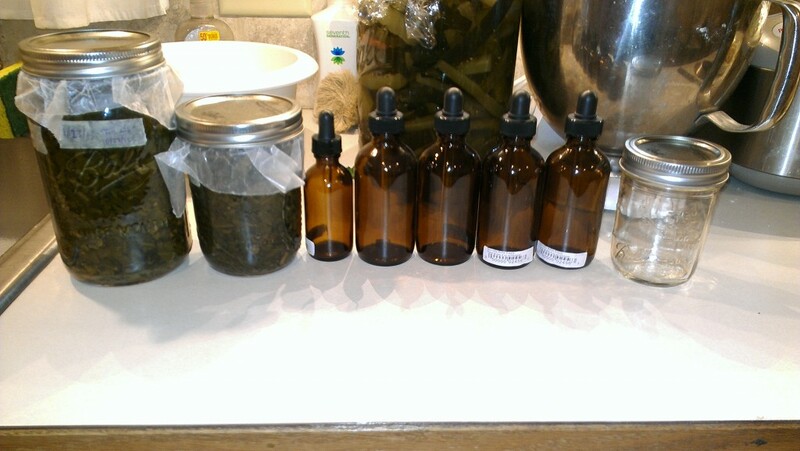 From there, all you have to do is get the tincture into bottles and jars (a fine-neck funnel helps a lot with this, as does an assistant who can keep things from getting knocked over), clean them up, and get them ready for labeling. You want to avoid having a huge amount of air in the bottles, and you might want to top off the strained tincture with a bit of fresh vodka before starting to fill bottles. Word to the wise: if you’re using dropper bottles, you’ll need to leave more airspace because the dropper will take some of it. Once they’re all sealed, label them with the contents (“Dandelion whole-herb tincture in 50% alc.”), the length of extraction (“steeped 5 weeks”), the date (“11/15/2013”), and anything else you want to add. Sometimes I add the location where I collected the plants: (“Collected at home, Potsdam NY”). Store them in a dark location that doesn’t get direct light. If they bubble or hiss when you open them, consider discarding the contents. Otherwise, it seems to last for years. That’s it! 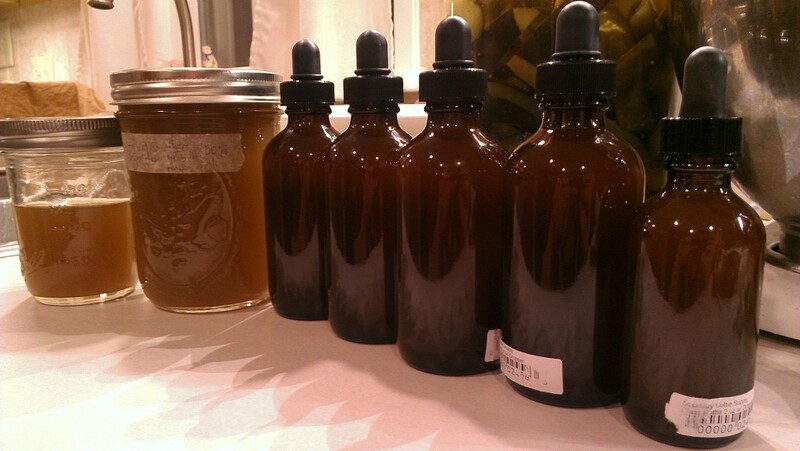 Enjoy your homemade dandelion tincture! If you want to make more, here’s the recipe and the identification guide. I have one dropper bottle and have stored of the rest of the tincture in mason jars, refilling the dropper bottle as necessary. I assumed it was better to store the mason jars in a cabinet (away from light) but wondered how particular I should be with that… Thoughts? I think that makes good sense, Ally. I’ve been storing mine in a sunny windowsill (where it steeped) because I want to keep an eye on it to check for signs of contamination, but once I’ve watched it a bit longer I plan to move them to a dark part of my basement. Like you, I think preventing light exposure is probably a good thing. How’s your stash holding up? Got enough to take you through the winter? I have no idea what this is for, but it looks awesome. Not as awesome as your face in that picture though. It’s an herbal medicine that I started taking on the advice of one of my doctors–I’ve had a bunch of digestive issues since getting Lyme disease last year, and the dandelion tincture seems to help with some of them. I don’t get as many pains in my abdomen when I’m taking this stuff, and that’s a welcome change! There’s more about the how-to-make-it part at http://www.holliseaster.com/p/dandelion-tincture/ , and you can find a bunch of references on the interwebs about why and how much to take. For me, I notice a difference, so I keep taking it! What all can the dandylion tincture be used for, how is it taken, what all can you substitute vodka/alcohol with, can you make a lower quality “potion” using water, and do you have any more recipes and can you mix herbs. We found this helpful! 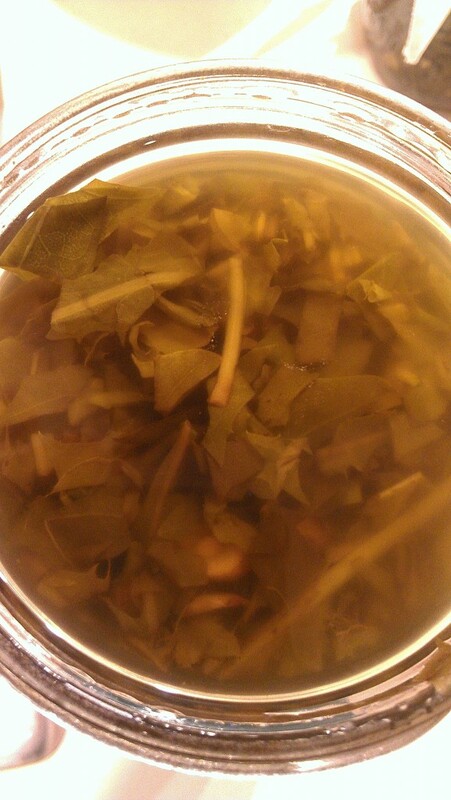 We are making other tinctures, i.e. Yarrow, Plantain, Echinacea as well as the Dandelion. We have also used an 80 proof which is distilled 7 times which one can get away with if money is short. Do not want to advertise a brand but it was Platinum 7. I will say that I thank the Father of the Universe who made heaven and earth and for His wisdom to include edible food and herbs for us. He knew we would contract these diseases, some of which we bring on ourselves with poor eating habits. Praise Him!